Equally concise and straight forward is the title of his latest album. Sambop is a fusion of two terms - the latter associating the core style of modern jazz, while the first alludes to the most important form and the most influential rhythm of Brazilian music - standing for the musical and artistic concept of the present album: the encounter of Samba and Bop, or rather: Morello and his three musical peers merging Bop jazz and the diversity of rhythms, forms, and voices of Brazilian music into a whole, into something new and beautiful, as if Samba and Choro had always been played on the semiacoustic jazz guitar; or as if Duke Ellington had first designed his "I'm Just a Lucky So and So" as a funky Baião". 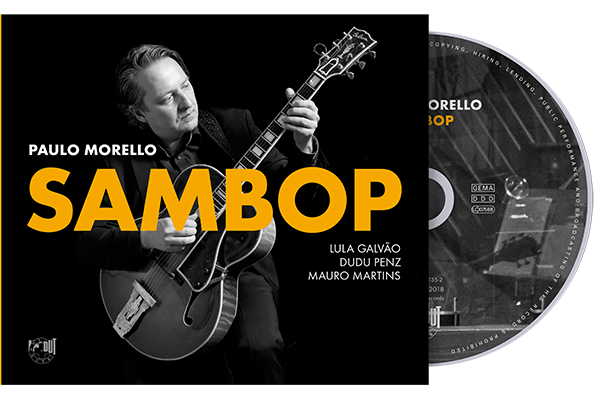 If they choose a jazz standard it becomes "brazilianized", and if they decide in favor of a Choro like "Nosso Amigo Esmé" Morello's soloing comes out to be just as jazzy and bop-style, as if Brazilian Choros have always been a part of the jazz repertoires and influences of role models like Wes Montgomery, George Benson, and Pat Martino.